Earlier this year, we reported that breast-feeding women are widely viewed as less competent. Newly published research suggests it would be unwise to share that unflattering opinion with them. According to a team led by UCLA health psychologist Jennifer Hahn-Holbrook, lactating women display higher levels of aggression than both non-mothers and their bottle-feeding counterparts. What’s more, their blood pressure stays low even as their combativeness increases, which may be nature’s way of allowing new mothers to calmly but effectively deal with potential threats. Writing in the journal Psychological Science, Hahn-Holbrook and her colleagues describe an experiment featuring 33 mothers with infants between 3 and 6 months old, and 18 women who had never given birth. Seventeen of the mothers exclusively breast-fed their baby; the other 16 used formula either some or all of the time. Those who sometimes breast-fed were asked to abstain from the practice for at least 12 hours prior to the experiment. The women participated in a computer game that measured their reaction time to threatening images. Each was told she would be competing with another participant, whom she was introduced to at the outset of the experiment. To increase the participants’ irritation level, their purported competitors — who were actually female research associates — acted rude at this initial meeting. Specifically, they “were trained to ignore participants, chew gum and check their cell phones for 20 seconds while the experimenter spoke during the training period,” the researchers write. Participants were told that when they won a round — that is, when they spotted and responded to the threatening stimuli more quickly than their competitor — they could “choose the volume and duration of an aversive sound burst administered to the loser.” They selected the intensity level of the unpleasant noise before each round, and the length of time it would last (up to five seconds) each time they won. The mothers were separated from their babies during the experiment — except for a break in the middle. During this time, exclusively breast-feeding mothers engaged in breast feeding; the other mothers bottle-fed their infants; and the non-mothers simply relaxed. All had their blood pressure measured at various times before and after this interlude. 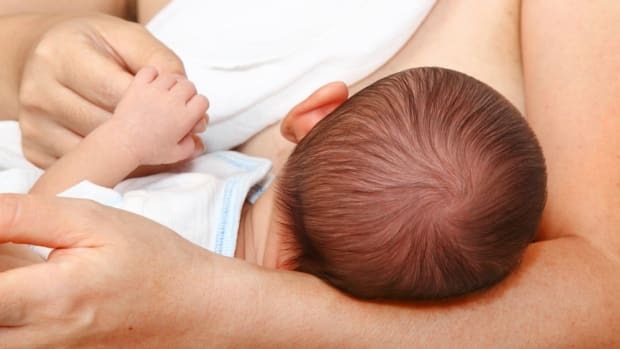 Mothers who exclusively breast-fed their infants “were almost twice as aggressive” as the other participants, inflicting louder and longer bursts of noise on their opponents. In contrast, “formula-feeding mothers did not demonstrate more aggressive behavior than non-mothers,” the researchers report. Furthermore, “Exclusively breast-feeding mothers had lower blood pressure during the aggressive encounters,” the researchers write. This suggests lactation reduces “otherwise prohibitive levels of maternal fear,” allowing mothers to aggressively respond to any perceived threat. Hahn-Holbrook and her colleagues don’t believe lactation “engenders hostile behavior indiscriminately.” Research on other mammals suggests breast-feeding is “likely to boost aggression primarily in contexts in which either the mother or her offspring are in jeopardy,” they write. So, at a time when relatively few American mothers breast-feed, here’s another advantage this natural practice provides: The ability to remain calm while aggressively responding to threats.